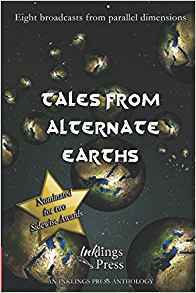 There's a double dose of good news for the Inklings Press anthology Tales From Alternate Earths. First of all - and the big, big, BIG news - is that two of the stories from the collection have been shortlisted for the Sidewise Awards in the short form category. How big is that? Well, one of the rivals that the stories are up against is Bruce Sterling, whose Pirate Nation has an introduction by Warren Ellis, while the judges include the likes of Matt Mitrovich and Stephen Baxter. It's a really big honour for one story to hit that shortlist - let alone two. The shortlisted stories are Daniel Bensen's Treasure Fleet - in which the Americas are discovered by the Chinese - and Twilight of the Mesozoic Moon, by Brent A Harris and Ricardo Victoria, a tale of time travelling spacefaring dinosaurs, no less! And that brings us to our second piece of news - Tales From Alternate Earths is available NOW in paperback! You can pick up the new paperback from Amazon right here. So pick it up before the awards are presented in August, and see what has drawn the attention of the top judges in the alternative history genre!